How long is the share? 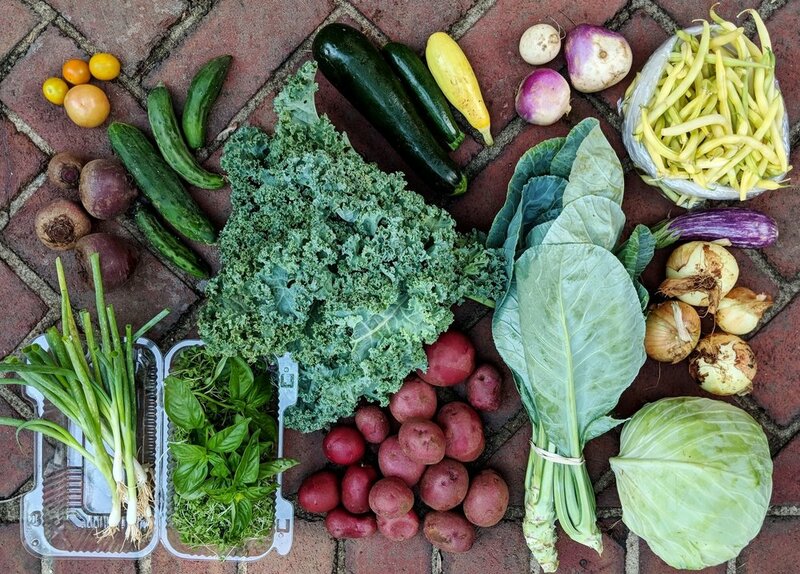 You will receive between 9-15 different vegetables each week. We offer two 14-week sessions: a spring/summer and fall share. You can sign up for one or both of the shares. The first pickups of each session will take place on the given start dates barring any delays incurred by weather, and will continue for fourteen consecutive weeks. For those participating in both session there will be a break of several weeks in August to accommodate anticipated production shortages. How do I pick up the share? Arrive at your set pick-up location during the designated times our trailer will be there (as indicated in your check-out) and use the key card mailed to you to enter the trailer. It is important that you bring your own bag to transfer your share from the Wild Hope Farm bins to your bag. We have a limited supply of reusable bins and by not using expensive cardboard boxes we can keep our prices low and save resources. It is important for members to leave plastic bins inside the trailer so the farm will have enough bins for the next pickup. Members will be charged $25 to the credit card on file for removing bins. Absolutely, yes. We understand that the shares contain a lot of produce and many people would like to participate in the program but simply can’t use up all the food each week. What if I'm unable to pick up one week or on vacation? You may have a friend or neighbor to pick up your share if you can't be there on your delivery day. You can also donate your share for the week to a family in need through our partnerships with organizations like Urban Ministries and Room in the Inn. Should you have to cancel your share PRIOR to the start of the program a refund minus a $15 processing fee will be issued. If it is necessary to cancel during pickup season, a refund will only be given if there is another member to replace you. If a new member can be identified as a replacement, a prorated refund will be given minus a $15 processing fee. CSA program staff can assist in finding a replacement. Please contact the CSA coordinator in this circumstance. Can I become a member for part of a season? Unfortunately no. We have two 14 week programs to accommodate those who would only like to join for a shorter period or just during the summer or school year. Members can choose between the two share options (Summer and Fall) or sign up for both. How does the CSA price compare to store prices? $39.55 (Based on MOFGA Organic Price Report's June and October averages). The cost per week for a full share is $33.